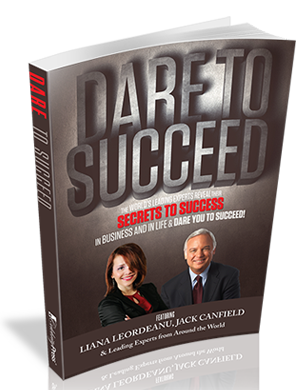 Liana Leordeanu | Dare to Succeed | Jack Canfield & The World’s Leading Experts Reveal Their Secrets to Success in Business and in Life and Dare You to Succeed! "The World's Leading Experts Reveal Their SECRETS TO SUCCESS In Business and Life and DARE YOU TO SUCCEED!" Get Liana's Complete Book Here! No matter what line of work you’re in, the marketplace constantly challenges you. No matter how savvy an entrepreneur or skilled a professional you are, you risk losing ground every day you don’t push forward. Dare to achieve your greatest ambitions. Dare to achieve the happiness and fulfillment you have wanted to attain. From Liana's Chapter in "Dare to Succeed"
Ten years ago and just out of college, I was riding high. I had a prestigious job with a global health-care company. Within two years, I was managing a sales force of 1,500 people and launching pharmaceutical drugs as a National Product Launch Manager. I was making a fantastic six-figure income, being able to buy anything I wanted, go anywhere I wanted, and having dinner with some of the finest people in business. Although I worked nonstop, I loved it, and I felt I was living my ideal life. I was well on my way to rising to the top. Jack Canfield, Liana Leordeanu, and all the other experts in this book hold "the secrets" to achieving optimal health, wealth, & lifestyle. Liana Leordeanu is a highly respected transformational speaker, life strategist and author. She is passionate about inspiring others to uncover their purpose, stretch beyond their self-imposed limitations and experience the greatness that is within them. At the top of her career her life changed permanently one night due to a nearly fatal car accident. Liana had to endure a journey that would reshape her life. Yet, she not only survived, she is alive and thriving. That night of the accident changed everything for her and about her and has given her a wealth of knowledge and insight she never expected to have. Throughout her long recovery she grieved for the person she once was, only to find there was more to herself than she could have ever imagined.